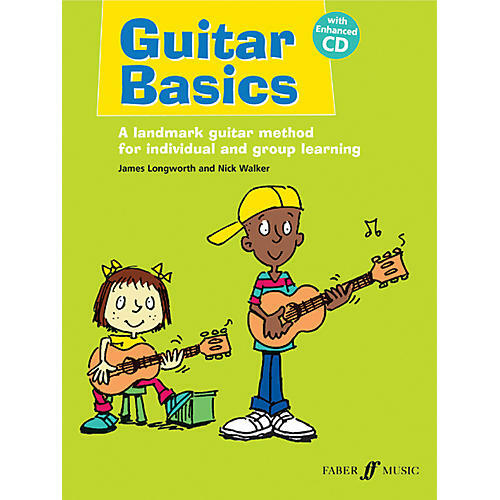 Guitar Basics starts at absolute beginner level and progresses to beginner level. The method is set out in fifteen stages and contains original pieces and traditional tunes in an array of styles including classical, folk and world music as well as well-known favorite film and TV themes such as James Bond, Batman and The Flintstones. There is a thorough introduction to standard notation, with sections on chords and TAB, whilst ensemble pieces are ideal for group teaching. The enhanced CD provides accompaniment parts, teachers' notes and tips for parents which are easily downloaded, or it can be simply used to play the fun backing tracks! By James Longworth and Nick Walker.